Taipei, Taiwan – May 10, 2017- CipherLab, a leading innovator in Automatic Identification and Data Capture (AIDC), proudly presents the RS50 Rugged Android Touch Computer to provide productivity that meets high-end market standards with a smartphone user-friendliness. Operating with Android 6.0 certified with GMS, the The RS50 series offers advantages in operation speed, power efficiency and data security. Integrating GMS (Google Mobile Service), users can also access applications such as Gmail and Google Map in the field for maximum output. The RS50 series also provides the ultimate mobility inside and outside the four walls. Reliable WiFi and LTE connections give RS50 constant connection to systems for clear and instant notifications of daily works. RS50’s dependable WiFi transmission features IEE 802.11 a/b/g/n/ac dual band while providing strong roaming support. On top of it all, its advanced LTE option allows large file transfer, video streaming and remote access to back-end systems. 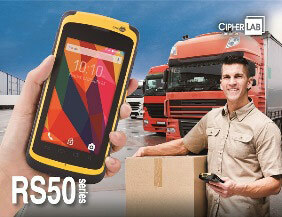 Users can always stay connected with the RS50 series. For more details and specifications regarding CipherLab RS50 series mobile computer or other CipherLab products, please visit www.cipherlab.com. CipherLab is a global leader in the design, manufacture, and marketing of Automatic Identification and Data Capture/Collection products and systems. The company’s mobile computers and scanners are integrated into the networks of some of the world’s best known logistics, retail, distribution, government installations and healthcare companies, helping them run more efficiently and effectively onsite and on the road. Operating worldwide, CipherLab is headquartered in Taipei, Taiwan with offices in China, Netherlands and the USA, and is publicly traded on the Taiwan stock exchange (Taiwan OTC: 6160). For more information, please visit www.cipherlab.com.